Org chart or obstacle chart? Whenever I take on a project in a new division or company, my first reflex is to look at the organization chart. I spend no more than 5 minutes on it, with a motive that may, or may not, surprise you: I am trying to understand who will stand in the way of my pursuit of Done. You see, for me, the org chart is an “obstacle chart”: it depicts the people who feel they are important enough to interfere with Done. (Sure, there are exceptions. But not many.) After this cursory 5 minutes, I then proceed with building my network. I look for the people within the organization that I absolutely need in my pursuit of Done: the admin who has been with the company 20 years and knows everybody, the anti-social Technical Expert who has no one reporting to him and yet is the reason that customers throw money at your company, the shipping guy who can ship your big system in a truck and get it across the country in two days because (surprise surprise) your current schedule doesn’t allow the “proper” time to ship. Once upon a time in capitalism. 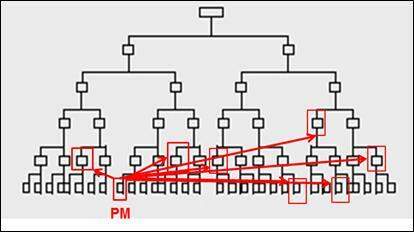 In order to understand the origins of the org chart, we need to go back to the birth of managerial capitalism, which I detail in this blog post. In summary, the second industrial revolution, which took place from 1860s to 1914, arose from a perfect storm of four significant simultaneous events: communication technology (the telegraph), electrical power replacing steam power, the growth the railroad and technological advances in manufacturing interchangeable parts. This perfect storm meant that making lots of the same thing resulted in a dramatic decrease in unit cost, as long as you kept making lots of those same things. This gave birth to factory assembly lines, which spawned large and complex corporations, which required managers to manage the resulting complexity. 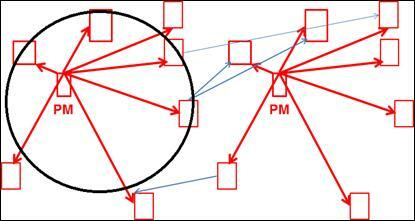 And what was the structure we came up with to organize the managers who were organizing the complexity? The only one we had, which we borrowed from slave plantations and the army: the command-control hierarchy. We need a different shape. While the command-control hierarchy was particularly effective in organizing the work of early twentieth century assembly lines, it was totally ineffective in organizing the work of projects. As a way to compensate for this ineffectiveness, the matrix structure was born. Is there a project manager who has not lived through the pain of all-the-accountability-and-none-of-the-authority of The Matrix? Of course, functional managers everywhere embraced this structure, and why wouldn’t they? What’s not to love about all-of-the-authority-none-of-the-accountability, or what I fondly call “have your cake and eat it too”? When you look at these two organizational structures, they essentially boil down to two shapes: a triangle (command-control) and a square (matrix). But seriously, don’t our teams look more like this? In other words, power shifts away from the executives towards networked teams, because it is the teams that have the knowledge and capability. Most importantly, the role of the executive moves from commanding and controlling in an Enterprise 1.0 organization, to inquiring and aligning in an Enterprise 2.0 organization. Next generation leadership will have absolutely nothing to do with authority and with telling people what to do. If you’re an old-school command-control executive reading this, you’re scared out of your mind. If you’re a project manager reading this, you’re nodding your head. Because you know what? Next generation leadership. Somehow we project managers get the job done and deliver projects, and this despite being constrained by dysfunctional organizations poorly structured for collaborative work. How do we do this? We build networks that circumvent irrelevant “org charts”, we motivate and influence team members over which we have no formal authority or power, we share information and communicate despite inadequate 80s-style technologies and tools, and we do it with very little or no help from “bosses” and “functional managers”. Somehow, we deliver business value and successful projects by getting people to work together, to collaborate, despite the limits of command-control structure. Project managers are already next-generation leaders. Let’s show those executives how it’s done, shall we? Go forth and change the world. It’s about time, don’t you think?